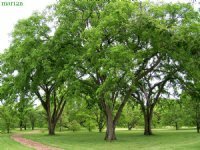 AMERICAN ELM - STATE TREE OF NORTH DAKOTA is a medium to tall, rapid growing tree with an open crown which may reach over 50 feet in height. Adapts to a wide range of soil types best in rich, moist, well-drained soil. Drought tolerant - USDA Zone 2 hardy. Produces winged seeds. Can be susceptible to dutch elm disease. Riparian plantings, and windbreaks.